I am very grateful to announce that I have been nominated for the Very Inspiring Blogger Award by the Belmont Rooster – Lonnie Miller. His blog is fascinating to a gardener like myself. He’s been at it for years and you can tell. He’s collected hundreds of plants that he talks about and shows us in his posts on two different gardens he’s done. He also sprinkles in some good old fashioned wisdom now and then about the human condition, and that all makes him a Very Inspiring Blogger himself, as well as his other awards and many great posts. He’s a bit of an activist blogger and does a lot of work for his Awards and posts. I think that’s great! You can see his work at: http://thebelmontrooster.wordpress.com/ and I strongly encourage you to do so. Thanks a bunch for this Award, Lonnie! Thank the person who nominated you and supply a link to their blog. Contact your nominees to let them know you have nominated them and provide a link to this post about it. Proudly display the award logo (or button) on your Blog, whether on the About page, your sidebar, or on a special awards page. I love steamed greens with balsamic vinegar and a touch of butter. I just read a series of books about a moral wizard. I like the Afro-Celt Sound System a lot. I don’t exercise enough and it’s killing me. I wear glasses to see this computer but not to see Life, yet. OK, that’s done. Whew! So, on to the next, and most important piece of the things I have to do – Nominate my nominees. I have to say a couple of things here to explain myself to some people. I got the notion from Lonnie that I had to contact the people I wanted to nominate First and get their approval Before I nominated them. I have since learned that it’s far easier and more common to simply post your favorites and let the cards fall where they may as far as people accepting them. So I’m doing a bit of both. I’d already contacted several people when I learned this advice so to those I contacted I say Thank You for letting me nominate you whether you’ve responded to me yet or not. The important thing is to honor You and say you deserve this Award for your Excellent blog. If you want it I applaud you for being willing to carry it on and follow the rules. If you don’t want to I understand and still think you Rock! So here are my favorite inspiring blogs as of right now this moment because it could change in a minute when I read something new I like. I’m not fickle but I do like a lot of different things… I could have listed more frankly. Some I’ve followed for a year, some for a couple of weeks, but I like them all and they’ve all meant something good to me. Here are my Nominees, in no particular order. You all have Wonderful blogs that have definitely inspired me and I thank you all for them! I really hope you’ll take the time to visit these extraordinary bloggers and their wonderful blogs. To the nominees: To make it a bit easier here are a couple of links that tell you more about the Award and how to put it up on your site. I used this and it was pretty easy to do. The hard part is linking all your nominees to your post. That took some time and energy, but it’s just copy and paste so it’s not really that bad. It’s a lot of work to receive these Awards I’m finding and I wonder about the necessity of all the rules. But I see that they are necessary if the Awards system is to continue and I hope it does. I’m doing my best to follow them and I hope you will too if you accept the Award. It’s meant as a compliment to you and not as extra work, tho I know it is. Here are a couple of links from Lonnie… This is to his post about receiving the VIB Award and he shows you a bunch of possible logos you can use so I’m posting the link to them here instead of trying to redo them all on my site because I don’t know how. 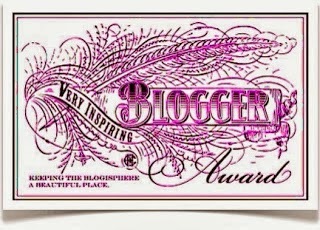 Check this out: http://thebelmontrooster.wordpress.com/2013/11/25/my-very-inspiring-blogger-award/. You can also go to a site that he recommends there to get the story on putting the logo on your site itself in the sidebar. It’s from the site by Lorraine Reguly and has a neat video that explains it well. Here it is: http://lorrainemariereguly.wordpress.com/2013/09/17/how-to-add-images-to-your-sidebar/. So I guess I’ve covered everything I can think of. I’m really happy that we have these Awards. I notice a lot on some sites and none on others and I wonder why? Now I have a better idea. First you have to be nominated for an Award and then you have to do some work to make it continue. I think it’s a great way to introduce your community to new blogs they might not have heard of or read. It’s a good thing and I’m totally glad I got this Award. But I’ll think twice the next time, if there is one, before accepting I think. I’ll see what this does for me in terms of getting more likes and follows and especially comments. I don’t get many of them and I treasure them all. Please do talk to me if you like my own work. Feedback is essential if we’re going to be good at this and I’ve gotten enough to make me feel like it’s worthwhile to continue but I could use more. I wish that for everyone on here – that you have people like your posts and follow and comment on your blogs. It’s a good system and there are a Lot of us on here so what you say can have far reaching effects. That’s a good thing I think. I always try to speak directly to my readers with what I have to say, and I know that my words will echo out into the blogoshpere for years potentially. Nothing ever goes away on the net…. So blog well and conscientiously and have fun doing it. Thank You all again for Inspiring me with your blogs. You’re very welcome. You deserve it! You may think you’re a novice but you have a Gardener’s soul and that’s all you need… 😉 Good for you for being so cool! A total and complete surprise. You made my day, I’ll be posting it shortly. You’re very welcome. I have enjoyed your site for some time and felt this was a just Thank You for your fine work. Thank you for the congrats, and congrats to you as well. It’s fine to take your time with it. I’m glad you’re into it! There are a Lot of great blogs out there to choose from. You are right, there are a lot of great blogs out there, sometimes I wish I would have more time to read them all , there is always something interesting ! WELL! That was so AWESOME! I am really happy I nominated you and I just knew you would have an AWESOME post! I will check out your nominees. Good luck with your blog and I wish you continued success! 😀 That was wonderful, Lonnie. You have a great way of making people feel good about themselves. It’s very much appreciated! I hope I kept to the rules OK for you. Your post was a tremendous help to me in doing my award. Thanks for everything and I wish you all the best as well! You’re very welcome. You do a great job with your blog and I enjoy it a lot. I see this is Award week for you. Congratulations on all of them! Thank you so much. Same to you! Thank you, Cedar. I’m pretty happy about this. I’ve made new friends already! It’s just great! No problem, as I said in my post. I just like to turn people on to things I like and I think your blog is excellent. Thanks for your kind words. Thanks for letting me know you got the award. Congratulations to you. Thank you for your words and for adding my link to your post. Congratulations on your award! Thank you for checking them out. I’ve done the same with yours and found some great blogs that I followed as well. These awards are a wonderful way to be introduced to new blogs. It’s partly why I do it. I’ve been trying to visit all my nominees, and even their nominees, (whew! ), as it seems you are too. That’s what makes this work so well. There are so many good blogs out here on WordPress and I’m glad to have found so many of them. We’re lucky to be a part of it all! Thanks, Steve. You are mighty kind. Cheers. You’re very welcome. I love your blog! I always laugh along with your posts…. Very cool!